With more than 300,000 Twitter followers, a heaping helping of controversy, and a rich supply of attitude and humor, Humphry Slocombe is not your average ice cream shop. Yet the ice cream is what matters, and they make it in dozens of glorious, unique, and delightful flavors. The Humphry Slocombe Ice Cream Book collects 50 recipes for these idolized and iconoclastic flavors, as well as surprising sundae combinations and popular toppings such as marshmallow and crumbled curry cookie. More than 50 color photographs, dozens of graphics and drawings, and first-person essays and scenes from the shop present a delicious foray into this scoop of San Francisco’s incredible food scene. Excerpted from The Humphrey Slocombe Ice Cream Book by Jake Godby and Sean Vahey with Paolo Lucchesi, with photographs by Frankie Frankeny (Chronicle Books, copyright © 2015). You can purchase The Humphrey Slocombe Ice Cream Book at your local bookshop or through our affiliate links with IndieBound or Amazon. 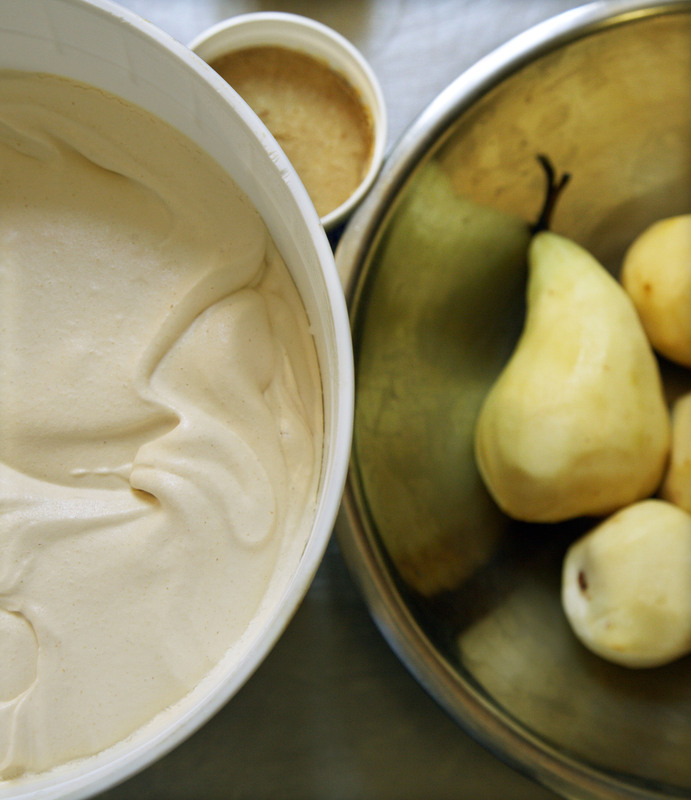 We make White Miso ice cream in the summer with peaches, in the fall with apples, and in the winter with pears. Alice Waters would be so proud of us … you know, if she knew who we were. 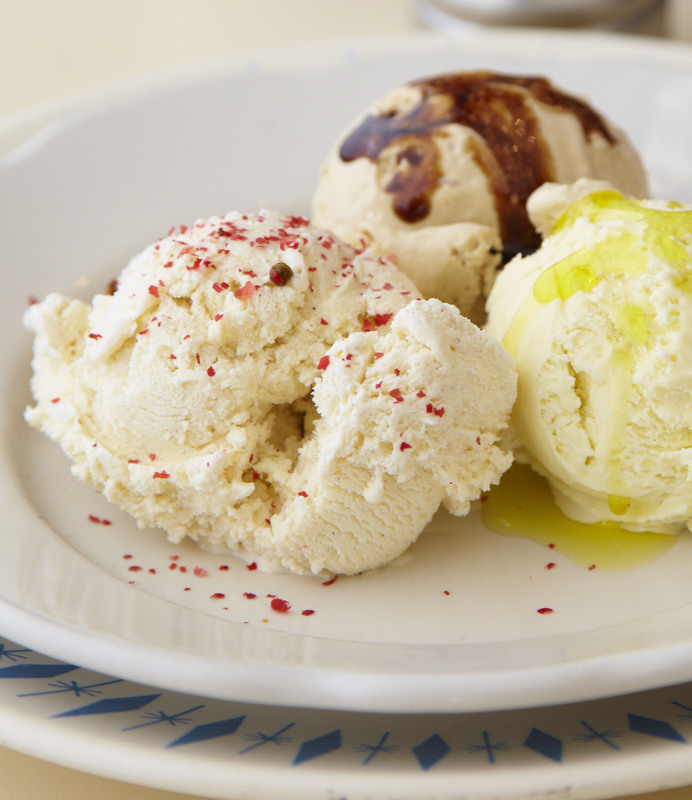 Doing a flavor with miso was a natural and logical extension of our love for savory elements in our ice creams. Miso is a thick traditional Japanese soy paste that’s often used as a condiment or a flavor ingredient in cooking, and it’s been growing in popularity as an ingredient in desserts. Since miso is so salty, this is one of the few recipes in the book that doesn’t call for added salt or vinegar. In his search to get the flavors right, Jake went to a Japanese supermarket and bought pretty much every kind of miso in the joint: red miso, mixed miso, rice miso, purple miso, soy-only miso, miso-horny, and so on. He eventually settled on a white style. White miso is much more delicate than its counterparts. It’s mellow. He still doesn’t know what the label says, but boy, it sure gets the job done. White Miso is another “Wow” flavor, with distinct umami undertones that pair well with the seasonal tree fruits. It also goes secretly well with a scoop of Guinness Gingerbread, or simply a little splash of olive oil on top. Inspiration: Jake used to serve miso apple butter with crepes and olive oil ice cream. In a medium, heavy-bottomed saucepan over medium heat, melt 3/4 cup of the sugar, stirring often, until it takes on a nice sandy color and is a smooth liquid, 10 to 15 minutes. Quickly add the fruit and stir to coat with the sugar; this will prevent the sugar from caramelizing any further and/or burning. Cook until the fruit is soft, about 10 minutes or so, depending on which fruit you’re using and its ripeness. Transfer the caramelized fruit to a blender. Add the miso and process to a smooth purée. Set aside. In a large, heavy-bottomed, nonreactive saucepan over medium heat, combine the cream and milk and cook, stirring occasionally, until hot but not boiling. Meanwhile, in a medium bowl, whisk together the egg yolks and the remaining 1 cup sugar until well blended. Remove the cream mixture from the heat. Slowly pour about half of the hot cream mixture into the yolk mixture, whisking constantly. Transfer the yolk mixture back to the saucepan with the remaining cream mixture and return it to medium heat. Cook, stirring constantly with a rubber spatula and being sure to scrape the bottom of the saucepan so it doesn’t scorch, until the liquid begins to steam and you can feel the spatula scrape against the bottom of the pan, about 2–3 minutes. Remove the custard from the heat. Add the fruit-miso mixture and stir to mix completely. Pour the custard through the strainer into the clean bowl you set up in the ice bath. Let cool, stirring occasionally. Taste for sweetness; add a little more sugar if needed. Looking through this book, it’s obvious that vinegar is a big part of our ice creams—and our personality. It’s a favorite ingredient because it adds an unexpected savory twist, while helping offset the sweet richness that’s usually found in ice creams. Jake is neither sweet nor rich, at least not yet. Prior to opening Humphry Slocombe, we knew we had to do some kind of caramel flavor, but we also knew that we didn’t want to do salted caramel, because everyone had already done that. Enter balsamic vinegar, which possesses natural caramel undertones anyway. It’s become, you could say, one of our more divisive flavors. When our guests ask for a sample of it by calling it simply “Caramel,” their taste is often followed by a look of confusion. We quickly figured out that guests weren’t even registering the word “balsamic,” instead thinking it was just a caramel ice cream. Of course, upon tasting, they were taken back by the jarring explosion of vinegar. Here’s a typical interaction at the shop. We now write it on our flavor board as BALSAMIC caramel and everyone lived happily ever after. In a large, heavy-bottomed, nonreactive saucepan over medium heat, melt the butter with 1 1/2 cups of the sugar. Watch carefully; as the mixture begins to melt and darken around the edges, stir the sugar with a heatproof spatula to incorporate it. It will look a little sandy, but that’s OK. Continue cooking until the caramel takes on a deep amber color and is a smooth liquid, about 15 minutes. Immediately add the water to stop the cooking. Caramel can go from being a perfect, smooth brown color—dare we say mahogany?—to being burnt and smoking in a matter of seconds. Be very careful when adding the water, because the caramel will splatter when the water hits it, and blisters on your hands just aren’t cute. After the water is in, heat gently, still over medium, stirring until incorporated and the caramel is a smooth liquid again. Now you work just as you would with your usual custard base: Add the cream, milk, and salt and cook, stirring occasionally, until the mixture is hot but not boiling. Remove the cream mixture from the heat. Slowly pour about half of the hot cream mixture into the egg-yolk mixture, whisking constantly. Transfer the yolk mixture back to the saucepan with the remaining cream mixture and return it to medium heat. Cook, stirring constantly with a rubber spatula and being sure to scrape the bottom of the saucepan so it doesn’t scorch, until the liquid begins to steam and you can feel the spatula scrape against the bottom of the pot, about 2–3 minutes. We lost our beer virginity with Guinness Gingerbread. It wasn’t even awkward, messy, or a one-time thing. It was the first beer ice cream we made. We wanted rich and dark, since we opened in the middle of winter—you know, prime time ice cream season. The ingredient list is one of the only long ones in this book, but it’s the perfect holiday ice cream: complex, yeasty, and full of spices. 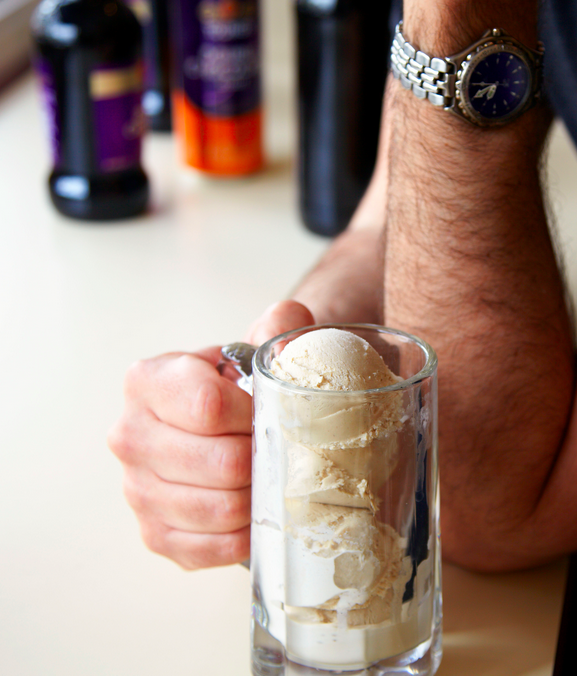 What better prospect to pop your beer ice cream cherry? It worked for us. Inspiration: This recipe draws upon Claudia Fleming’s gingerbread cake recipe from her book The Last Course, Jake’s favorite dessert cookbook when he was starting out in pastry. Fill a large bowl or pan with ice and water. Place a large, clean bowl in the ice bath. Remove the cream mixture from the heat. Slowly pour about half of the hot cream mixture into the yolk mixture, whisking constantly. Transfer the yolk mixture back to the saucepan with the remaining cream mixture and return it to medium heat. Add the stout, molasses, vanilla, cinnamon sticks, star anise, peppercorns, and red pepper flakes. Cook, stirring constantly with a rubber spatula and being sure to scrape the bottom of the saucepan so it doesn’t scorch, until the liquid begins to steam and you can feel the spatula scrape against the bottom of the pot, 2 to 3 minutes. Remove the custard from the heat and immediately pour it into the clean bowl you set up in the ice bath. Let cool, stirring occasionally. When the custard has totally cooled, cover the bowl tightly and chill in the refrigerator overnight. When you are ready to freeze the custard, strain it into a bowl and stir in the ground ginger and cinnamon. (The ginger and cinnamon are added just before freezing, as they have a tendency to give milk and cream a slimy texture if allowed to sit too long.) Transfer the custard to an ice cream maker and spin according to the manufacturer’s instructions. Right after spinning, fold in the gingersnaps. Eat immediately or freeze for up to 1 week. Free advice: Since the beer ice creams are all so high in alcohol (compared to other ice creams, that is), they probably won’t freeze completely in your ice cream machine—depending on what kind of machine you have, of course. Don’t fret; freeze as best you can in the machine and finish it off in the freezer. Transfer to an airtight container, cover, and freeze until it reaches the desired consistency. Note: this video starts quietly for the first 30 seconds. Frankie Frankeny is a San Francisco-based food and lifestyle photographer. 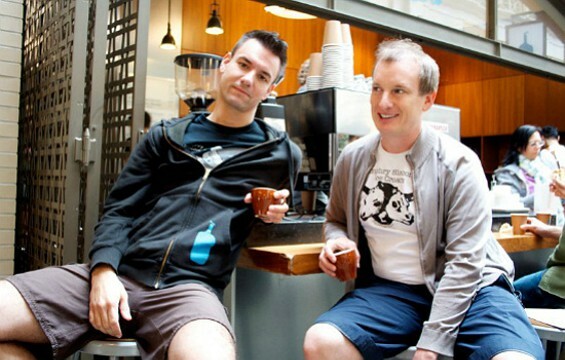 Here’s an in-depth interview with Jake and Sean. This entry was posted in Eat, Eat: Book Excerpts, Eat: Recipes and tagged Eat, ice cream, Jake Godby, Paolo Lucchesi, Sean Vahey. Bookmark the permalink.